A Stanford University research lab have created unique technologies designed to handle two of the biggest energy challenges facing mankind today. One is grid-scale energy storage, and the other is clean fuel for transportation. The researchers illustrated their findings in two research studies published in the Science Advances and Nature Communications journals. For sometime now, hydrogen fuel has been promoted as a clean alternative to gasoline. Since last year, hydrogen-powered cars have been offered to American consumers by automakers, however only a few have been sold. One of the primary reasons was the limited number of hydrogen refueling stations. Millions of cars could be powered by clean hydrogen fuel if it were cheap and widely available. While gasoline-powered vehicles emit carbon dioxide, these hydrogen cars do not emit anything. Although, manufacturing hydrogen fuel is not emission free. In the current scenario, manufacturing large quantities of hydrogen fuel requires natural gas in a process that would emit carbon dioxide into the air. To tackle the problem, Cui and his colleagues have zeroed in on photovoltaic water splitting. This up-and-coming technology comprises a solar-powered electrode dipped completely in water. When sunlight touches the electrode, it produces an electric current that splits the water into its constituent parts, oxygen and hydrogen. So far identifying a reasonable way to manufacture clean hydrogen from water has been a tough task. Traditional solar electrodes consisting of silicon rapidly corrode when it comes into contact with oxygen, a chief byproduct of water splitting. Numerous research teams have been able to decrease the corrosion effect by coating the silicon with iridium and other precious metals. Cui and his colleagues introduced a novel technique using bismuth vanadate, a cheaper compound that absorbs solar energy and produced modest quantities of electricity. This was illustrated in the June 17 edition of Sciences Advances. Bismuth vanadate has been widely regarded as a promising material for photoelectrochemical water splitting, in part because of its low cost and high stability against corrosion. However, the performance of this material remains well below its theoretical solar-to-hydrogen conversion efficiency. Bismuth vanadate absorbs light; however it is a poor conductor of electricity. A solar cell made using bismuth vanadate has to be very thinly sliced (200 nm or less) in order for the cell to carry current. The cell is virtually transparent. This results in visible light being able to easily pass through the cell and generate electricity. Cui’s team sought assistance from the field of nanotechnology to be able to trap sunlight before it escapes. 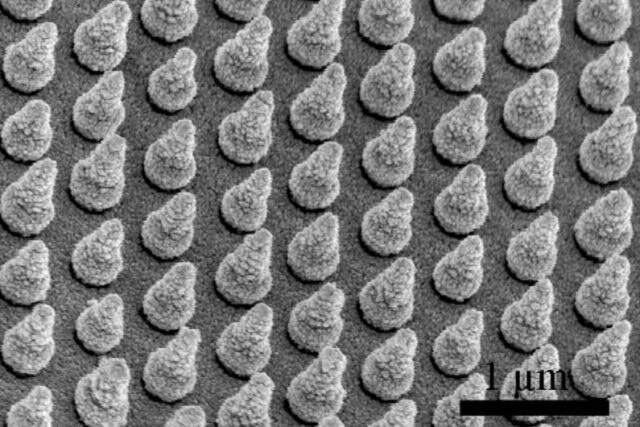 The researchers developed microscopic arrays made up of several silicon nanocones, each measuring approximately 600 nm in height. Nanocone structures have shown a promising light-trapping capability over a broad range of wavelengths. Each cone is optimally shaped to capture sunlight that would otherwise pass through the thin solar cell. Cui and his colleagues deposited the nanocone arrays on a thin film of bismuth vanadate during the experiment. Then both layers were mounted on a solar cell created using perovskite, another capable photovoltaic material. When immersed, the three-layer tandem device instantly started to split water with a 6.2% solar-to-hydrogen conversion efficiency, which matched the theoretical highest rate for a bismuth vanadate cell. In another research published in the June 6 issue of Nature Communications, Cui and Shougo Higashi, a visiting researcher from Toyota Central R&D Labs Inc., put forward a novel battery design capable of providing a solution to the problem of grid-scale energy storage. Solar and wind farms should be able to provide around-the-clock energy for the electric grid, even when there’s no sunlight or wind. That will require inexpensive batteries and other low-cost technologies big enough to store surplus clean energy for use on demand. In the research, Cui, Higashi and their colleagues designed a new battery comprising electrodes containing nickel and zinc, which are low-priced metals with the probability for grid-scale storage. An assortment of zinc-metal batteries is currently present in the market; however only a few are rechargeable, because of miniature fibers known as dendrites that grow on the zinc electrode during the charging process. Theses dendrites tend to grow until they finally contact the nickel electrode, resulting in the short circuit of the battery. The dendrite issue was solved by the team by just redesigning the battery. as an alternative to having the nickel and zinc electrodes face each other, like in a traditional battery, the team isolated them with a plastic insulator and enclosed the edges of the zinc electrode in a carbon insulator. With our design, zinc ions are reduced and deposited on the exposed back surface of the zinc electrode during charging. Therefore, even if zinc dendrites form, they will grow away from the nickel electrode and will not short the battery. Shougo Higashi, Visiting Researcher, Toyota Central R&D Labs Inc.
To show constancy, the researchers effectively charged and discharged the battery over 800 times without short circuit effect. Great work... hope to see it materialized in our near future ! !